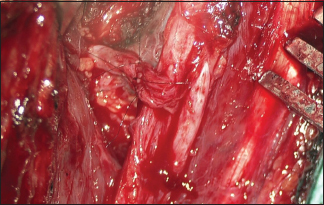 This picture was captured by Dr. Dattaraj Sawarkar, Assistant Professor, Department of Neurosurgery, All India Institute of Medical Sciences (AIIMS), New Delhi. This picture of the two spotted owlets was taken in Keoladeo Ghana National Park in Bharatpur, Rajasthan, India, in the early afternoon. These spotted owlets are found in the region extending from India to South East Asia. Although they inhabit farmlands, they have also adopted to living in major metropolitan cities. They are small stocky birds, barely 21 cm in size with a round head, a heavily spotted crown, yellow eyes and white eyebrows. The upper part of their torso is grey-brown, heavily spotted with white; the under part is white, streaked with brown. They roost in small groups in the hollows of trees or in cavities within the rocks. Their colours merge so imperceptibly with the surrounding branches of trees that it is often difficult to spot them. 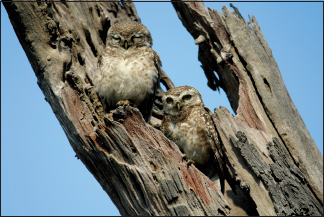 The two “spotted owlets” that we observed were sitting on the branch of a tree basking peacefully in the sunshine. One characteristic behaviour of the spotted owlets is that when disturbed during their daytime siesta, they bob their head and stare at the intruders. On a closer look, one owlet was completely engrossed in himself with eyes closed, being oblivious to the happenings around him (this probably was due to the experience that he had gathered over the years in his protected sanctuary). The second one looked alert and was staring at the little movements around. It was clear that he was keenly observing the activities in the surrounding vicinity. The behaviour of these two owlets was very similar to that observed in the two 'species' that constitute an integral part of our medical community: One who has his/her eyes closed and is oblivious to his/her surroundings; and, the other who is alert and watchful! This photograph was taken with a Canon EOS 1300 D camera in aperture priority mode with an aperture setting of f/5.6, an exposure time of 1/400 sec, a focal length 179 mm, and ISO of 100. 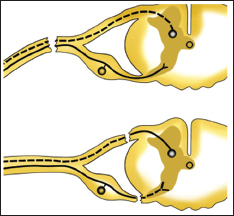 Ramachandran S, Midha R. Recent advances in nerve repair. Neurol India; 2019;67:S106-14.